for all your San Antonio Home Buying needs! I have to say that the occasional rain shower over the last week or so has been very, very, very welcome, and so have the cool fronts. Anything which delays the full frontal blast of wicked summer heat by a week or so is a good thing in my book. But it has been a good month in the garden; what a difference a mere four or five weeks have made. This year, I bit the bullet – the only plant starts that I bought were tomatoes. They went into a pair of Earth Boxes, and six home-made hanging planters. So far, lots of big green tomatoes, but nothing edible yet. For just about all the other plants this year, I began with packets of seeds from Lowe's; three or four kinds of beans, sugar peas, three kinds of squash, and five seed potatoes from Rainbow Gardens. The bell, jalapeno and cayenne pepper plants are left over from previous years, as are the eggplants. I had never really thought of them all as perennials, but they all came back very nicely from winter. The pepper plants are thriving, and the eggplants all have fresh new foliage and are hung with star-shaped purple blossoms which herald fat little eggplants, or so I hope. 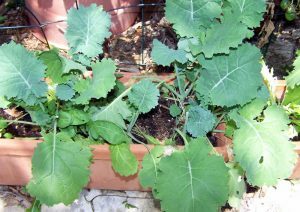 The okra plants began from seeds from last years' okra plants. I didn't know that you have to pick the okra pods as soon as they are about four or five inches long; any bigger than that, and they are totally inedible. So, I had a boat-load of okra seeds. Until now I had never had much luck growing vegetables from seeds. Very likely, I was doing it all wrong in trying to cultivate the terrible, horrible, awful clay soil that my yard is made of. Even digging in sand and compost didn't help much. Last year we used Scott's Moisture Control Potting mix in the pots and Earth Boxes, and things generally did very well. This year we filled the two raised beds with it, planted squash and potatoes in one, and beans in the other, crossed our fingers and hoped for the best. 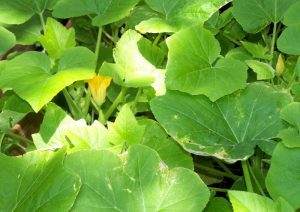 The squash have begun putting out blossoms; it looks like the little green patty-pan squash are going first, with the yellow squash and the zucchini lagging slightly behind. 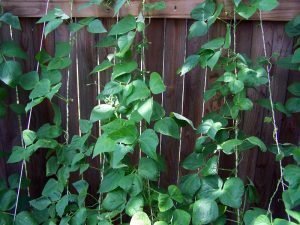 The beans – the Kentucky Wonder variety began going up the string net which I had run from the edge of the raised bed to the top of the fence as if there had been some green bean drill instructor screaming at them to climb. As of this week they are covered in little white and purple flowers. These things are supposed to bear copious quantities of beans – and harvesting them regularly encourages even more. I still have packets of other varieties of beans, and hope to start another couple of small raised beds. 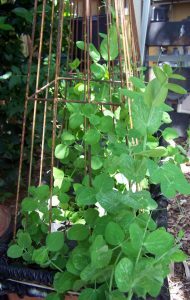 It seems that I have inadvertently hit on the right place in my garden to grow pole beans; partly shaded for much of the day, but growing up against a south-facing fence. 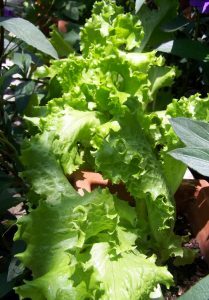 I also had a packet of lettuce seeds, and another of mixed salad greens, which just this week had enough leaves to harvest and use in salads. Oh, the taste of fresh greens is indescribably good. When the squash plants are exhausted, and I dig up the potatoes in the fall, I am planning to put up a plastic tent over the large raised bed and sow more salad greens and lettuce inside. I'd like to be able to eat out of my own garden for the rest of this year, and even have enough excess to freeze. And that's my week in the garden – what about yours?